The vibration cleaning sieve adopts vibration motor, and drives gravity weight to rotate oppositely with the uniform speed so as to realize cleaning. It is suitable in particle material cleaning or classifying for these industries: flour milling, grease, brewing, rice grinding, feeds, chemical industry and food processing industry. It is also widely used in grain storage processing enterprises. By changing different specifications of sieve plate, we can remove the big or small impurities from wheat, corn, paddy and oil plants. The materials go into decentration cone hopper (6)through inlet pipe(5);then get in the middle of material plate(9)of the box(8) through cloth(4).The box vibrates with sieve to scatter the materials uniformly to the total width of the sieve on the bottom plate (11). If the materials are not even-distributed,the adjusting plate (7)makes the feed charge in an ideal state. 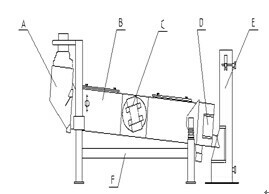 The pressure door (10)is installed on the joint of box and sieve,which makes the materials uniformly scatter at the same hight.The materials go through the pressure door and sprinkle on the first sieve(3) with big impurities on ,which are discharged through the side outlet(1). The mixture below fall on the second sieve (2) with small impurities below falling on the bottom plate (12) to go out through outlet(13).The mixture on the second sieve is discharged through pressure(14) to vertical air suction separator (15),which is adjustable with the handle (16) to excellently separate the materials by switching the air door to proper position.